LEGO continues to drop images of upcoming sets that will be displayed at SDCC 2014! This time thanks to MTV we have a look at the LEGO Star Wars Rebels Wookiee Gunship and one of the many LEGO sculptures that will be at the LEGO Comic Con Booth: Star Wars Rebels Chopper Droid. 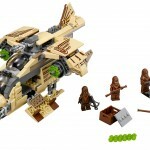 Protect Wullffwarro and his Jedi friend, Kanan Jarrus, with the powerful LEGO Star Wars Wookiee Gunship. As featured in the Star Wars: Rebels animated TV series, this amazing battle-ready craft has loads of weapons to see off any invading force, like movable front cannons and an elevating top cannon. When the action really heats up, raise the wings into attack mode and unleash the never-before-seen rapid shooters! If you run low on ammo, open the side hatches to access the spare supply, then lower the rear bay door and unload the mobile gun post. Includes 4 minifigures with assorted weapons: Wullffwarro, Kanan Jarrus and 2 Wookiees. Available January 2015, 570 pieces, $69.99. The Star Wars: Rebels Chopper Droid contains 11,774 bricks, and took the LEGO Master Builders 143 to design and build. He stands 36 inches tall, and weighs 58 pounds! Check out all the new LEGO SDCC 2014 Star Wars Rebels images after the jump.